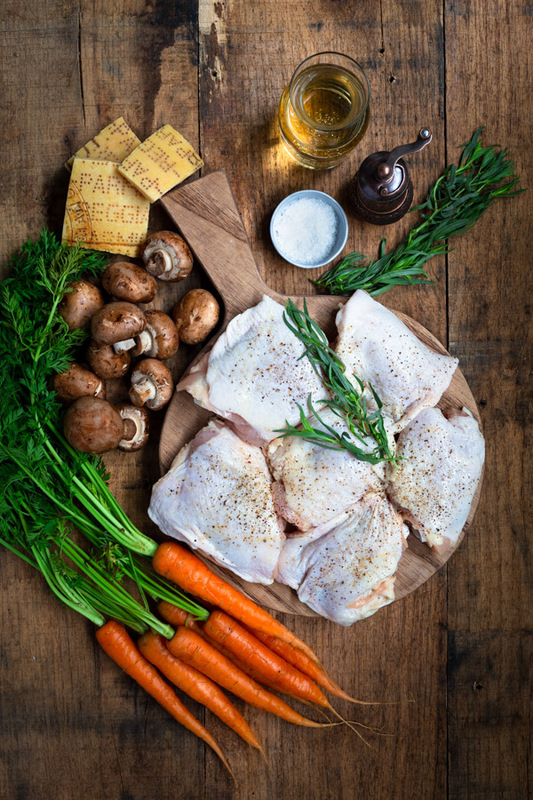 I can’t tell you how many different titles I considered for this recipe before settling on Creamy Chicken in White Wine Sauce. There’s a lot going on in this dish flavor-wise and I wanted to highlight them all. 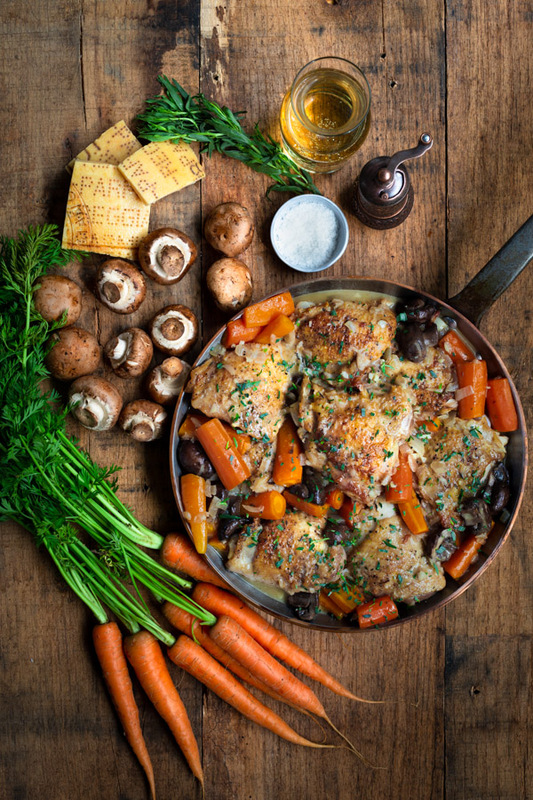 However, if I had included everything, the title would have been something like Braised Chicken Thighs in Tarragon Parmesan White Wine Sauce with Mushrooms and Carrots. That seemed excessive and impossible to remember. So, I’ll give you the highlights here. First, tarragon. I think tarragon and chicken is an underrated combination. If you’ve ever had a good tarragon chicken salad, you know what I mean. Tarragon in a creamy white wine sauce is even better. Second, Parmesan cheese rinds. Those often discarded rinds from blocks of fresh Parmesan cheese add a lot of flavor to soups and stocks. 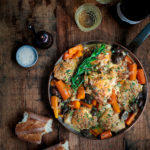 A Parmesan rind simmered in the braising liquid along with the chicken in this recipe adds a deep richness to the final sauce. 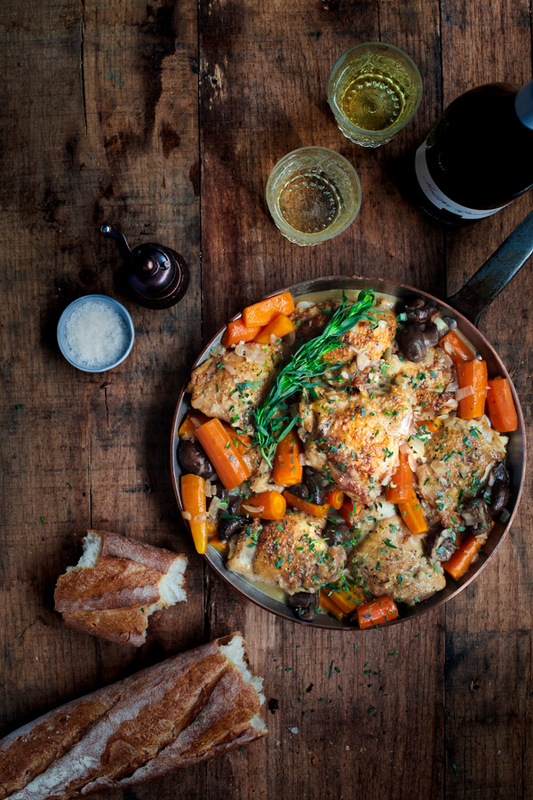 You’ll want to serve the braised chicken with a crusty baguette to sop up all that delicious sauce. I keep a stash of Parmesan rinds in my freezer but if you don’t have any on hand, check the cheese counter at your grocery store. I’m finding that more and more grocers are offering them now. Lastly, mushrooms and carrots. Granted, there’s nothing insanely novel about mushrooms and carrots but it does let you serve a complete meal (with veggies) in one-pan. One-pan recipes are always note-worthy in my book.